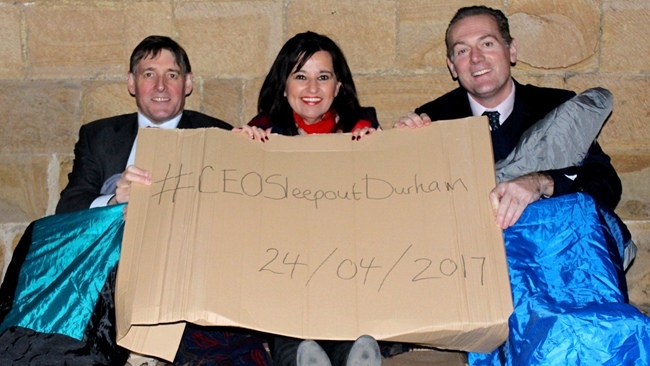 “I’m honoured to be representing Durham Business Group taking part in the first CEO Sleepout to take place in the cloister of the magnificent Durham Cathedral, hoping to raise as much money as I can to support Durham’s most needy. Those that know me well know this is so far out of my comfort zone, right up there with my Sober October of 2013. I don’t own a sleeping bag and have a fear of bats! However, one night of hardship for me can make a difference towards some of the hundreds of homeless across our region enduring bitter cold and dangerous conditions night after night, and with your help it can! This experience of course is only one night and in no way compares to the difficulties the homeless have to face each day – but it’s a challenge I can do and I hope it will raise awareness and make some difference to those less fortunate.